A physiologist interested in the effects of gravity on biological process, such as I, must understand how living organisms transduce those effects. In my favorite organism, the human body, there are many avenues for such transduction. At the scale of a meter, the weight of the limbs on the joints is readily sensed in even the most casual of circumstances. The weight of the extended column of bodily fluids as it distends tissues and organs is only slightly subtler, but dramatically noticeable when one hangs upside down by the ankles. At the scale of centimeters, there are the organs of balance, which are collections of cells forming the vestibular system that is specifically sensitized to both static gravity and induced acceleration (which Einstein told us is indistinguishable from gravity). But some biologists are interested in the effects of gravity at the cellular level, and ask whether a single cell, with a dimension measured in millionths of a meter, can sense gravity independently. There are structures within the cell that might be sensitive enough, but in a normal living cell, the gravitational stimuli would be overwhelmed by non-gravitational stimuli such as thermal agitation. Determining gravitational sensitivity in isolated single cells requires carefully controlled, well-designed experiments. Unfortunately, some biologists interested in this topic don’t understand the physical phenomena involved (just as some physicists don’t understand biological systems). In 2009, I read an article in the journal Developmental Dynamics that claimed to demonstrate the gravitational sensitivity of single nerve cells from the developing spinal cord of the zebrafish. I cannot challenge the authors’ knowledge of neural cell physiology, but their interpretation of the physical phenomena involved was in error. Some colleagues (Maneesh Arya and Susan Steinberg) and I drafted a letter to the editor of that journal explaining the errors, but the journal does not print letters to the editor (1). The editor recommended a full article, which we were not able to undertake. This is all you need to know about the primary cilium for this article. I have pondered the article, “The primary cilium as a gravitational force transducer and a regulator of transcriptional noise” (Moorman and Shorr, Dev. Dyn. 2008, vol. 237, pp. 1955-9), for well over a year now, troubled that my understanding of several points of gravity and its influence did not seem to match that of the authors, as detailed on pages 1957-8. The authors seem to report that isolated cells in culture can detect changes in ambient earth-surface gravity environment due to the passage of the moon and the sun overhead. They reported a clever and imaginative comparison of neurogenin-3.1:gfp (ngn3.1:gfp) expression in the Rohon-Beard neurons of the developing zebrafish spinal cord at the times of the local high and low tide as evidence of an influence of the moon’s gravity on ngn3.1:gfp expression, presumably mediated through the primary cilium (2). Their report, while recent, already seems to be becoming accepted by others who cite their findings without further question (3, 4). Unfortunately, their assertions regarding lunar and solar gravity at earth’s surface are flawed (5). The authors are correct that the effective gravity at earth’s surface is not quite constant. In addition to extremely small regional and latitudinal variations, there is indeed the influence of the gravities of the sun and the moon. However, the authors mischaracterized the dominance of the moon in generating earth’s oceanic tides as being due to its gravitational pull on objects at earth’s surface. Instead, the tides are actually due to the greater gradient (e.g., decrease with distance) of the Moon’s gravitational force across the width of the earth than that of the sun. The tides in the Raritan River near the authors’ laboratory are not reliable indicators of the moon’s gravitational influence in New Brunswick, NJ. High tides recur at 12.42-hr intervals, first when the moon is above the horizon, and its gravitational influence opposes earth’s downward pull—and again 12.42 hr later when the moon is on the other side of the earth, and its influence would augment earth’s downward pull. Thus, any randomly selected high tide might be associated with either lunar gravity adding to or subtracting from earth’s surface gravity environment. Low tides occur at the halfway points between successive high tides, so the moon’s gravity influence should be at some intermediate value, neither greatest nor least. In addition, local high and low tides may be offset from the overhead passage of the moon by many hours. For example, in New Brunswick on Aug. 15, 2010, moon transit—when the moon was highest overhead and its gravitational influence should have been greatest—was at 17:55 EDT (6) while local high tide was 7.9 hr later (7). A more appropriate indicator of lowest effective gravity level might be the time of the moon’s transit overhead, when its gravity acts opposite to earth’s; highest effective gravity level might then come 12.42 hours later when the moon is on the opposite side of the earth and its gravity sums with earth’s, which may be calculated as 9.81 m•s-2, defined here as 1.0 G. In this highly-simplified example, the variation in effective gravity due to the moon’s influence would 0.000034 m•s-2, approximately 0.0000035 G (3.5 micro G), over a period of 12.42 hr, due to the earth’s apparent daily rotation under the moon. Note that even in this simplified, optimized case, the Rohon-Beard neuron would be required to detect a variation in earth’s surface gravity of one part in 300,000 occurring gradually over more than 12 hours! The sun’s influence on earth’s surface gravity environment is much greater. In the simplified case of the Rohon-Beard neuron on earth’s surface directly on a line between earth’s center and the sun, the “weight” sensed by the primary cilium would be greatest when it is on the side of the earth directly opposite from the sun (e.g., at local “midnight”), and thus subject to their summed gravitational pulls, and it would be least when it is directly between the earth and the sun (e.g., “noon”). At midnight, it would be subject to the sum of earth’s surface gravity plus the sun’s effective gravity at the distance of the earth from the sun, 0.0059 m•s-2, or approximately 0.0006 G (600 micro G); the sum is 1.0006 G. At noon, it would be subject to the difference, or 0.9994 G. In our simplified example, the neuron would be subject to this solar variation in effective surface gravity of 0.06% on either side of the average of 1.0 G repeatedly at 24-hr intervals. Note that the moon’s gravitational influence would be 1/176th of the sun’s, and periodically in phase and out of phase due to its monthly motion relative to the earth. neglecting a multi-hour lag between the passage of the moon over the laboratory and the occurrence of high tide. The entire foregoing discussion assumes that the primary cilium of the Rohon-Beard neuron could even detect the gravitational influence of the moon or the sun. However, the estimated variation of less than 6 percent of one percent is much less than other ambient influences acting upon the neuron, including thermal, vibrational, atmospheric pressure and others. A 70-kg laboratory technician approaching to within 4 cm of the cell culture before receding again while periodically tending the culture would provide almost as much gravitational influence as the moon! Modern gravimeters are more than capable of such sensitivities, but they are much more massive than the Rohon-Beard neuron and may require magnetic suspension and liquid helium cooling to eliminate extraneous environmental signals (8). Even if possible, reliable detection of such a small signal-to-noise ratio would probably require prolonged integration of the signal. Melvill Jones and Young (9) have proposed that the gravity sensors of the mammalian vestibular system do not signal detection of acceleration until sufficient acceleration has occurred to produce a threshold velocity of approximately 0.20 m•s-1 (recalling that velocity is the integral of acceleration). Arbitrarily assuming a comparable velocity threshold in the primary cilium of the Rohon-Beard neuron exposed to the moon’s gravitational attraction (0.000034 m•s-2) on earth’s surface, the neuron would need nearly 5,900 seconds (over 1.6 hr) for detection, assuming the force is provided completely and continuously, instead of increasing and then decreasing over a period of many hours. The authors propose a clever test of their observation of the influence of extraneous gravitational variations by use of a technique they refer to as “gravity clamping.” Unfortunately, this technique is not further described, but must be assumed to involve centrifugation, as there are no other techniques to increase gravity at earth’s surface by 10% for an extended period of time. However, centrifugation at 1.1 G would merely increase the background level against which the supposed variation would occur by 10%, since there is no such thing as a “gravity shield” to exclude the presumed influences of the moon and the sun in the authors’ laboratory. Rotation of the cells during centrifugation would have continually rotated their orientation with respect to the external environment, which might have been responsible for the reported effects if those effects could have been demonstrated convincingly. An additional control, perhaps using a laboratory test-tube rocker to randomize cell orientations without the putative gravity-clamping confounder, might have produced the same result. In short, the authors’ assumptions about the presence of a gravitational perturbation for the primary cilium to transduce appear to be unsupportable and their measurements not well controlled. Then there is the role of the primary cilium of the Rohon-Beard neuron as a gravitational force transducer. The authors calculated the approximate shear force that would be applied to the cell’s primary cilium by the assumed cyclic changes in earth’s gravitational field. They calculated the mass of a 10-micro-m diameter cell by multiplying its spherical volume, 523.6 micro-m^3, by the density of water, which they did not state but which I provide as 10-12 g•micro-m^-3 (i.e., 1 g•cm^-3). The cell’s mass is thus 5.24x10^-14 g, or 5.24x10^-17 kg—one-millionth of the value calculated by Moorman and Shorr. Thus, earth’s gravitational force on a single cell is 5.24x10^-17 kg X 9.81 m•s-2, or 5.14x10^-16 N, a factor of 10 less than the sensitivity of the primary cilium reported by Resnick and Hopfer (10) and cited by the authors. But even if the sensitivity was appropriate, any such stimulation of the primary cilium would require the capacity for its relative displacement with respect to the cell body—such as embedding the free end of the cilium in a large mass other than its own cell body, so that the presumed gravitational variations could physical displace either the cell body or the cilium but not both. The authors describe no such mechanism, but it is the subject of at least one recent report (11). Finally, the authors find evidence of a gravitational effect on cells in culture through, not their altered rates of gene expression, but their increased variability in gene expression at local high tide, a time of supposedly reduced gravity on earth due to the moon’s pull. However, they did not hypothesize that such variability would result, and gave no reason why it was a logical or meaningful result from such exposure. For these reasons, Moorman’s and Shorr’s results cannot be accepted as supporting any gravitational force transduction role of the primary cilium of the Rohon-Beard neuron of the developing zebrafish spinal cord, and, by extension, a direct gravitational effect on any single cell that depends on a mechanism ascribed to the Rohon-Beard neuron. That is not to say that such an effect may not exist, nor that it could not explain many of the observed responses to weightlessness of biological specimens ranging from isolated cells in culture to intact higher mammals. But, there is ample justification for most—if not all—of the observed effects of hypo- and hypergravity on complex biological systems to be derived from the influence of gravity on multicellular organ systems at a macroscopic level. Extraordinary claims require extraordinary evidence; unfortunately, the evidence provided by Moorman and Shorr does not suffice. 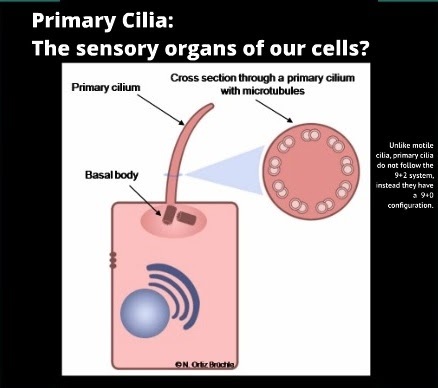 Primary Cilia: the sensory organs of our cells? http://prezi.com/itzhjckaguuc/primary-cilia-the-sensory-organs-of-our-cells/, accessed Apr. 20, 2014. Alaiwi, W., Lo, S., and Nauli, S. Primary cilia: highly sophisticated biological sensors. (Review.) Sensors 9, 7003-7020 (2009). I have relied on NASA’s Cosmicopia webpage (http://helios.gsfc.nasa.gov/qa_earth.html#tide, accessed on August 14, 2010) for most of the geophysical background information used in this letter. Source: U.S. Naval Observatory, http://aa.usno.navy.mil/cgi-bin/aa_pap.pl, accessed Aug. 14, 2010. Source: Mobile Geographics, http://mobilegeographics.com:81/locations/4111.html, accessed Aug. 14, 2010. Source: Gravimeter, http://en.wikipedia.org/wiki/Gravimeter, accessed Aug. 17, 2010. Melvill Jones, G., and Young, L. R. Subjective Detection of Vertical Acceleration: A Velocity-Dependent Response? Acta Oto-Laryngologica 85(1): 45-53, 6 January 1978. Resnick, A., and Hopfer, U. Force-response considerations in ciliary mechanosensation. Biophys. J. 93: 1380-1390, 2007. Blanco, C., Drayer, I., Kim, H., and Wilson, R. Mathematically modeling chondrocyte orientation and division in relation to primary cilium, published online at http://www.math.ucla.edu/~bertozzi/RTG/Summer2010/Bonegrowth-REU-2010-Part-II.pdf, August 6, 2010. Great article - an elegant and informative response to some scholars in error. Did you send them a copy? That's why we list corresponding authors on our journal papers -- to facilitate direct communications. It would be interesting to see their response. I would suspect that a biologist or physiologist at NASA has more opportunities to understand (or be forced to account for) physics than one in a typical academic institution. Is that true? Also, I have not the slightest facility with this level of physics knowledge, but I was struck by how your argument is a more sophisticated & elaborate version of the one I deploy when people try to convince me that astrology works. Same basic problems.